“Seek and you shall find“. A legal dispute that began its career on the ECJ’s level with a quote from the new testament (Matthew 7:7) has – for now – found its end in a judgement which is as confusing as a statement of the oracle in Delphi might be. 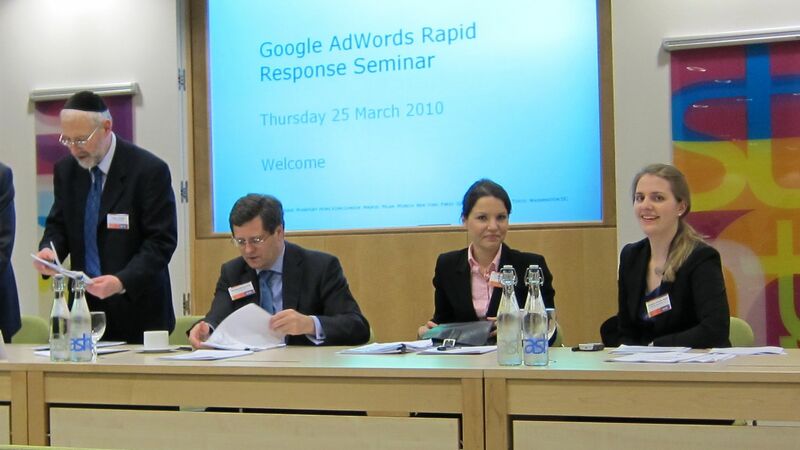 At this critical point the efforts of the IPKat have to mentioned who not only organized – on very short notice – a (Google AdWords Rapid Response) seminar at Ashurst for over 100 people interested in the issue, but who also provided the audience with an excellent summary of the controversial judgement. – The ECJ held that Google cannot (directly) be held liable for selling trademarks as keywords and subsequently displaying ads (triggered by the keyword=trademark). – Advertisers can be held liable on the basis of the content of their ads. The sole fact that they have booked a trademark as a keyword doesn’t amount up to a trademark infringement. National courts however have to decide if the “the ad does not enable normally informed and reasonably attentive internet users, or enables them only with difficulty, to ascertain whether the goods or services referred to by the ad originate from the proprietor of the trade mark or an undertaking economically connected to it or, on the contrary, originate from a third party“. Thus the court has missed its chance to simply say that, except for special circumstances (e.g. acts of unfair competition), ads not bearing the TM should not be seen as violating the TM-holder’s rights and ads that do contain the TM very likely do. – The court also seems to be in favour of the idea of granting Google’s AdWords service the liability exception provided by Art 14 of the eCommerce Directive. However the final decision on the subject of whether Adwords is “purely technical and neutral service” again lies with the national courts. – National courts have to decide whether users are able to ascertain if the goods or services originate from the trademark owner. This doesn’t sound like too difficult a task, but one has to look at the different national perspectives ranging from the ultra conservative French courts to the highly liberal German courts, who would for sure have little doubts to rule that the function of origin is usually not affected by an ad not containing the disputed TM. Or in other words, does allowing the (obviously anti-Keyword Advertising) French court to decide on the liability exception mean that the exception was not meant to be granted anyway? -The court seems effectively mistaken in its assumption that the (also protected) advertising function of the TM is not affected as the TM-owners website usually appears (rather high up) inside the search results anyway and thus the TM-owner still has the chance to advertise/communicate/convince potential customers. This sounds pretty reasonable at first glance, but if you think about it a bit longer you might wonder if one can really assume that a TM-holder can actually be found by users if his/her website is not displayed on the very first page of the search results. In theory one could assume that users might keep searching for the TM-owner, but I think the reality is that most users don’t have a clue about Boolean search operators and due to the Primacy Effect it is illusory to expect users to do little more than using the scrolling wheel of their mouse to scroll down on the first results page. Does this matter? I believe so, as in the cases at hand all of the claimants were listed on the first page of the search results. Thus, if a national court might have to issue a decision in a case where the TM-owner’s website is not shown (on the first page) in the search results, the (?French?) court might assume that his case is substantially different from the cases upon which the ECJ had to decide and is thus not bound to its ruling. I do know the last point, which was actually brought up by Dr. Stephan Ott in the course of preparing an article on that topic, might be a highly theoretical one, but… I would certainly not be surprised to see a national court using it to justify its decision. For more information on the cases please refer to the video stream of the Google AdWords Rapid Presponse Seminar, which was hosted by the IPKats, Eric Glodmann’s blog, Adam Smith’s article on the Blog of the World Trademark Review, a short article on OUT-LAW.com, a analysis (in German) by Dr. Stephan Ott on his Links&Law website or a short newspaper article (in German too) by Austrotrabant. A more elaborate version of this and Dr. Ott’s post will be published in the next issue of the German law Journal MarkenR; Ott/Schubert, Fremde Marken als Keywörter – Orakelsprüche des EuGH als Antwort auf biblische Fragen, MarkenR 2010, 173 (link hopefully coming soon). The book of Matthew is in the New Testament.